Breaking UBC records. Shutting out the country’s best. Brushing breakaways off with ease — and she’s got two years left. A mild-mannered third-year kinesiology student in class, but out comes a stellar goalie with quick hands and a quicker mind once she hits the ice. She’s one of the hottest names in university sports right now and our athlete of the month: Tory Micklash. If you saw Micklash walking down Agronomy Road, it probably wouldn’t hit you that you’re seeing one of the West’s best goaltenders passing by. Standing at 5’5”, she doesn’t have the most imposing figure. But that’s what makes her record even more impressive — in a position where height is usually a major bonus, Micklash still thrives. On the ice, her head is on a quick swivel, constantly scanning for opponents, teammates and of course, that small rubber disk hurtling towards her with malicious intent. Whether predicting where to put her blocker or simulating where the blocker would rebound a shot, her mind is running on overtime when she’s in the crease and she’s got the record to show for it. Boasting a .949 save percentage and 1.07 goals against average, Micklash is a mainstay in the upper echelons of U Sports hockey. 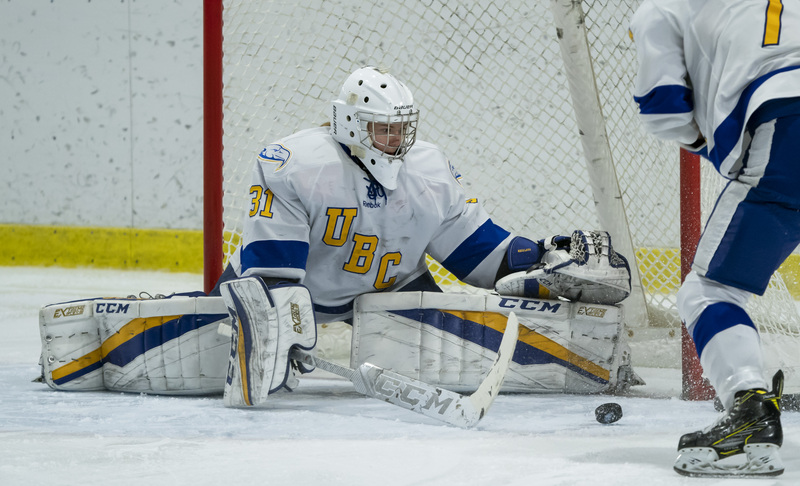 For the UBC starter, goaltending wasn’t even, perhaps, the initial plan for her in to the game. Micklash’s hockey career started in her home of East St. Paul, a sleepy borough just outside Winnipeg, where she was tearing up the ice since age five. “My brother played, my dad played growing up, so it was just something that was always part of the family,” she said. It turns out most of her hockey memories and inspirations come back to her family and their support over the years. Along with getting her comfortable on the ice, Micklash also credits her family as the ones who got her into the net in the first place. With both her father and grandfather playing in net in their own time, netminding was hardly a foreign concept to the family, but Micklash attributed one special influence on giving her that push into the posts. And there you have it: a record-breaking shot-blocker beginning with a bit of a ball-hogging brother. When you’re a student trying to attend lectures, keep up with friends, stay healthy and cobble together something to put on a résumé, you’ll probably find some of your focus slipping, now and again. For Micklash and the T-Birds, they’re facing all that plus near-daily workouts, grueling drills and missed classes while flying to exotic lands like Edmonton, with its stunning palette of greys and greys. When speaking to the drive that kept her going long after that backyard puck in East St. Paul, Tory gives credit to the Micklash clan in a way that has this hockey columnist looking to see who’s cutting onions. With the regular season winding down and the ’Birds poised to hit the national stage, Micklash shows an easygoing attitude that reiterates that alongside her bulletproof commitment to her team, she truly has fun when she is on the ice. 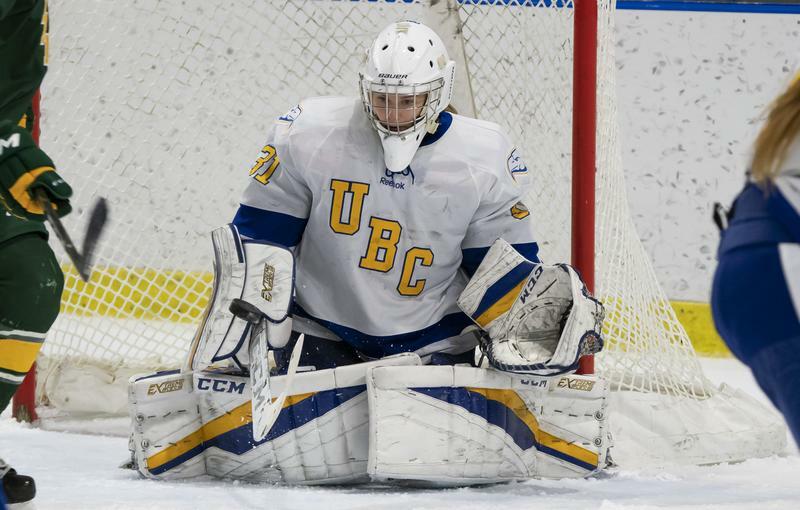 Where March spells cram sessions and fervent caffeine intake for most students, this goaltender holds a distinct glint of excitement to see the ’Birds take on the nation and see who comes up with a medal. Micklash’s confidence is backed up by the affection she holds for the folks she has at the rink. Beyond March, beyond this year and beyond UBC in general, Micklash shows the same vulnerability present in just about every student who has walked these streets: uncertainty. When you’re looking at the players skating quickly and hitting hard, you might forget that you’re looking at a regular student under padding and a jersey. As a kinesiology student who loves her sport, Micklash wants to continue her life in a way that merges those two worlds. But as for how that will turn out, who’s to say? It’s an odd comfort to be found in the fact that there exists real, phenomenal talent at UBC, but when it comes to figuring out how to direct that talent and passion, everyone’s in a similar boat. Micklash might be carving the ice up right now, but a glimpse into the future could see her as a coach, a schoolteacher or just about anything else under the sun. Undoubtedly, what matters to her right now is keeping things tight with both her families and seeing where the path goes, and it seems to be a good path to follow, regardless. One thing is for sure, though: whoever comes skating through that path afterwards for the Thunderbirds is sure to see the numerous marks that could’ve only been left by #31, Tory Micklash.